Vapor Intrusion in the Workplace – Redlog Environmental Ltd. I have previously discussed volatile compounds that are generated in the workplace from day-to-day activities and the hazards that they can pose to workers –Volatile Compounds in the Workplace: Part 1 VOCs. But, there is another less obvious source of volatile compounds in the workplace, and from my experience a source that is seldom considered in developing countries or even in the wealthy GCC countries of the middle east. That is the issue of vapor instruction into buildings from subsurface sources, namely contaminated underlying soils and groundwater. According to EPA, vapor intrusion occurs when there is a migration of vapor-forming chemicals from any subsurface source into an overlying building. Recognition of soil vapor intrusion to buildings and other enclosed spaces occurred in the 1980s with concerns over radon intrusion. 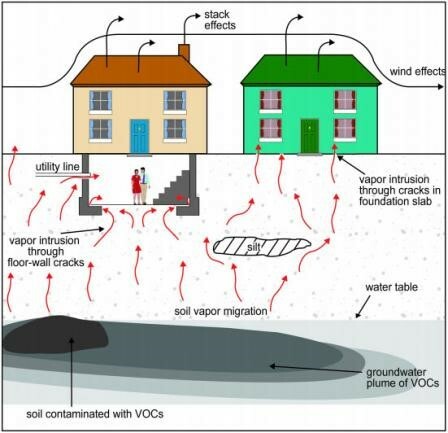 Subsequently, there was an increasing awareness that anthropogenic chemicals (e.g., petroleum hydrocarbons and chlorinated solvents) in soil, ground water, and sewers and drainlines could also pose threats to indoor air quality via the vapor intrusion pathway. This figure depicts the migration of vapors in soil gas from contaminated soil and groundwater into buildings. Vapors in soil gas are shown to enter buildings through cracks in the foundation and openings for utility lines. Atmospheric conditions and building ventilation are shown to influence soil gas intrusion. Septic tanks and sanitary sewers, e.g., dry cleaning operations releasing PCEs into sewer system and then leaks from cracks, joints, breaks. If you have any of sources on your site or if these sources were at the property from previous operations or from dumping at the site, then there is a potential for vapors to migrate into enclosed buildings on the site. Remember also that the groundwater system below your site does not respect your property boundaries! Contaminants can be carried from their source to below your property via groundwater. As you would expect, the potential for such vapors to enter a building will be a function of many different factors, including the quantity, concentration and chemical-physical properties of the volatile compounds, properties of the soil/groundwater, condition of the building foundation, joints and openings, etc. The risk posed by these hazards is a function of many factors, including the air flow dynamics of the building, the toxicity/characteristics of the volatile chemicals, duration of exposure, etc. There is extensive literature on the topic of hazard identification and risk assessment as it pertain to vapor instruction and I will leave it to interested readers to pursue this topic further on your own. The EPA’s Vapor Instruction site has good information and ample technical resources and is a good starting point. How Can I Figure Out if there is a Problem at My Site? Thus, for vapor instruction to pose a potential risk at your site, all three of these conditions must be present! If only one or two are present, then there is no risk. Are there currently or were there historically any of the sources listed above at the site? Are there currently or were there historically any of the sources listed above at nearby properties? Are there buildings on site? Are there basements and/or do the concrete pads/foundations contain cracks, gaps, holes? Are there people routinely working in the buildings? Are there building used as a residence? For those astute readers, you will recognize that I have provided two simple screening questions for each of the three risk components: hazard, pathway and receptor. So, if you answered yes to questions 1 or 2, then there is a potential hazard; if you answered yes to question 3 and particularly if you answered yes to question 4, then there is an exposure pathway; and, if you answered yes to questions 5 or 6, then there are receptors. Thus, if you have identified, via this simple screener, that your site has a potential hazard and an exposure pathway and a receptor, then there is a risk that vapor intrusion is posing a risk to people at your site. Note however that a potential risk does not mean there is a serious problem! More investigation would be needed to assess and quality the risks. If you are interested in learning more, EPA has a detailed technical guide for how to evaluate vapor intrusion, quantify risks, and suggestions for remediation and engineering controls. Of course, feel free to contact us if you need help with assessing this issue at your site. We will most certainly be pleased to help.